Click on the video to view our party bus, then give us a call to book . There is no better way to start the evening or end it. 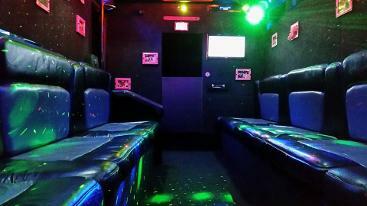 Enjoy the 10,000 watt sound system with on board karaoke and light show. Complimentary soft drinks are included so get your party started early. You are welcome to bring your own alcohol along with you. 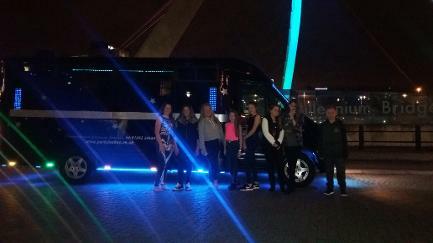 Here you can see our black 16 seat party bus next to the Millennium Bridge on the quayside in Newcastle. 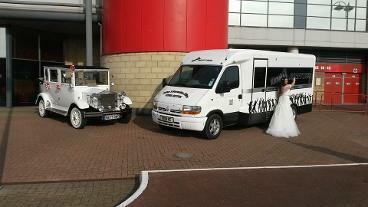 Party bus hire Middlesbrough and the north east. Party bus hire North East including Middlesbrough, Redcar, Stockton, Hartlepool, Darlington, Northallerton, Durham, Sunderland, Newcastle. Birthday party bus hire Cleveland and the north east. And superb 6 passenger seat vintage style wedding car. We are a small family owned and run business but big on customer service and value for money. Having started in the wedding car hire sector back in 1985 we know exactly what it takes to deliver a truly superb service at truly amazing prices. Customer satisfaction is our no 1 priority so you can rest assured that we will go that extra mile to make sure you have an exceptional and memorable experience in our limousine whether you are with us for a half hour hire, or a full day. You won't find better anywhere at any price. 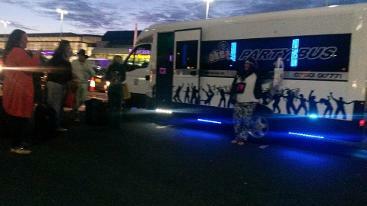 Call us now for your party bus quote. 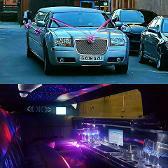 Our limo's have karaoke, music, and party lights so are ideal for any occasion. Pleas contact us for a quote. Please click on our packages and prices page for details and information on pricing and services we offer. If you can't see what you are looking for please give us a call to discuss your requirements and we will be delighted to give you a quotation. 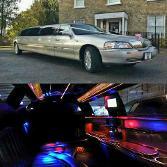 Limo hire north east . Best value. Childrens party ideas Middlesbrough our matching pair or Chryslers. Below our Chrysler saloon. Our superb 16 seat party buses can be booked anywhere in the north east. We are very popular up in Newcastle and Sunderland areas but will travel as far as Ashington, Blythe, Amble, Alnwick, Hexham, and parts of Northumberland. We also cover South Shields, North Shields, Durham, Consett, and also Bishop Auckland and Barnard castle. We can be often seen over in Catterick and Richmond with York and Leeds being popular destinations. We are a Middlesbrough based company so cover Redcar, Stockton, darlington Hartlepool, and Whitby. 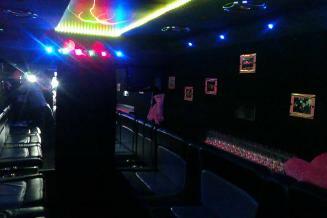 For the best karaoke party bus experience on wheels at great prices call us today.